How do the professionals put the odds in their favor when it comes to buying stocks? Here is a simple tool you can use. 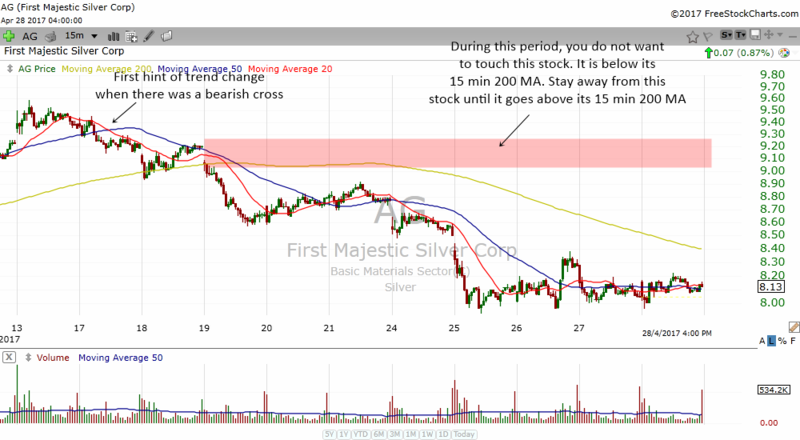 We will use the 15 min charts as well as some simple moving averages to help us to know when to enter and exit stocks. There is always a good time to buy stocks and to sell stocks. We increase our odds of success by knowing when is the best time to start buying. In order to be successful in trading, the trader needs to know when is the best time to buy and when is the best time to sell or short. The easiest way is to employ the moving averages to help us filter out the environment for buying or selling. A trader needs to know that the majority of stocks will follow the direction of the major indexes. The major indexes are the S&P 500, the Dow Jones Industrial Average and the Nasdaq Composite Index. In fact 75% of stocks will go up or down based on what the major indexes are doing. The SPY is the ETF that mimics the performance of the S&P 500 index. When we follow the rules above, we are actually putting the odds in our favor. The chart above shows when is the time to focus on longs or short. I have colored the area that is below the 15 min 200 MA red while the area above the 15 min 200 MA is green. From April 17th to 19th, we should not be taking trades on the long side. It is only on April 20th onwards that traders should focus on buying stocks. 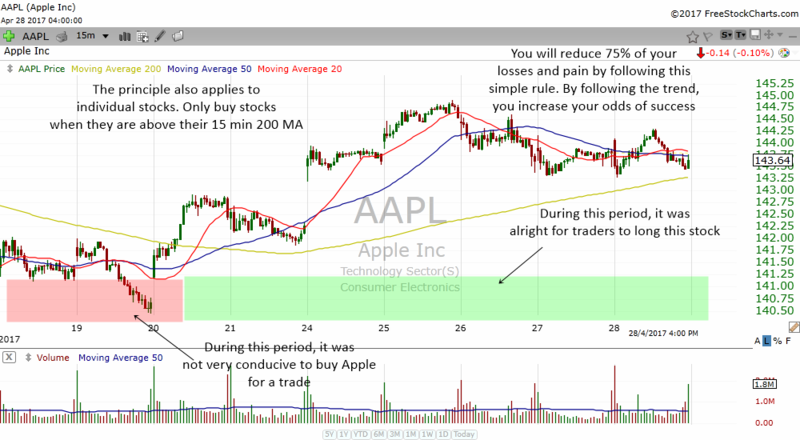 The chart of AAPL above shows the 15 min chart of AAPL. 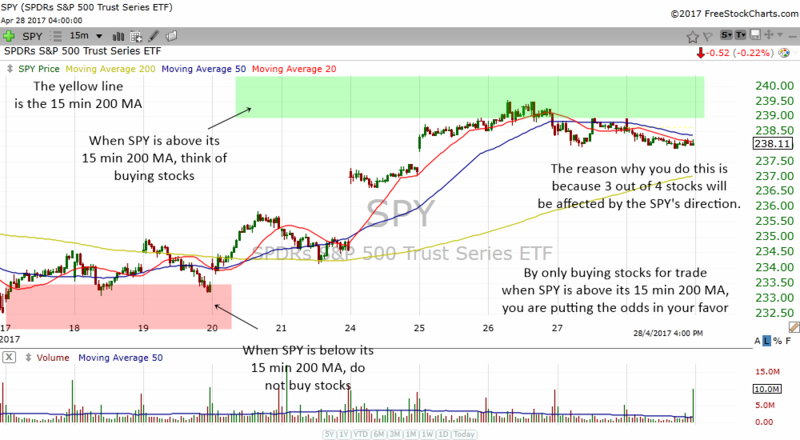 Once we have determined that SPY is above or below its 15 min 200 MA, we move on to determine whether the individual stock can be traded on the long side or short side. Do not buy when stock is below its 15 min 200 MA. Savvy traders can short the stock. Apple only went above its 15 min 200 MA on April 20th. You can see how the stock begin to move up from there. Traders should only buy the stock when it is above its 15 min 200 MA. The 15 min chart is very suitable to help us spot an early trend change in the stock. We do it by looking for bullish and bearish crosses in the moving averages. I like to use the 20 MA and 50 MA. When the 20 MA crosses above the 50 MA, this is a bullish cross and it gives us hints that the stock is about to have a trend change. On the other hand when the 20 MA crosses below the 50 MA, this is a bearish cross and it tells us that the stock may start to decline soon. Of course they do not work all the time but all nice trends will happen only after there is a bullish or bearish cross. 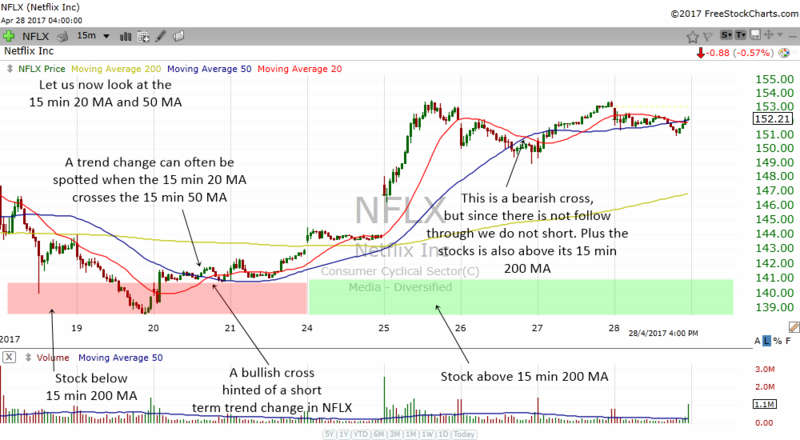 In the chart above, you can see how the bullish 20 MA cross 50 MA gave traders an early signal that NFLX was about to change trend. The stock was beginning to bottom and start a new 15 min uptrend. Although the stock is still below its 15 min 200 MA, it gave traders a very early warning that the stock is about to get bullish. The chart of AG above shows how a bearish cross hinted of a new 15 min downtrend in the stock. Notice on April 17th the stock had a bearish cross. It then dropped below the 15 min 200 MA and proceeded to drop over the next week. The 15 min charts can also help us to know when to take some profits off the table. Some traders will sell some positions when the stock drops below its 15 min 20 MA and 50 MA. Others will wait for a bearish cross to appear before selling some of their position. 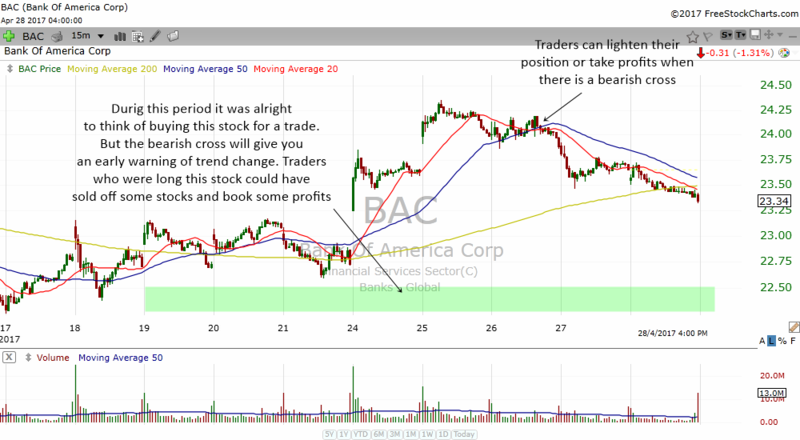 In the chart above, notice how BAC started to drop below its 20 and 50 MA on Apr 26th. On the same day, it also formed a bearish cross. Traders could have sold half of their position in BAC and book their profits. 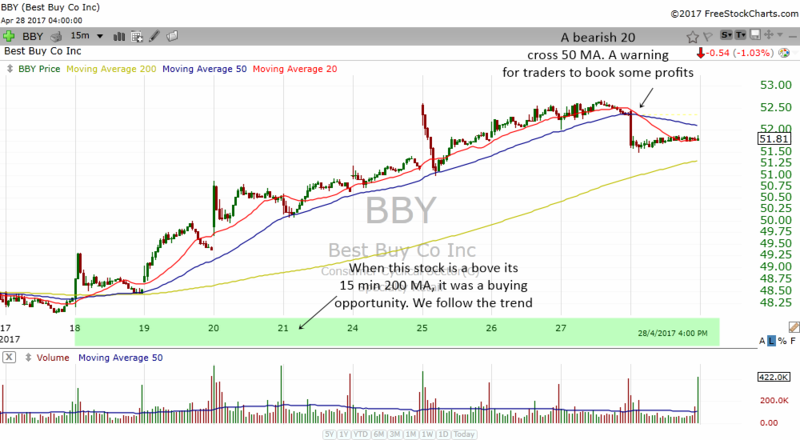 The chart above shows how BBY had a really nice uptrend in its 15 min chart. So when do we take some profits of the table? Notice the bearish cross around April 28th? That was a clear signal to traders to take some profits off the table. The true value of the 15 min chart comes when it helps traders to avoid trades that might have cost them thousands of dollars in losses. The 15 min 200 MA is truly a very valuable tool that you and I should take into consideration when we want to initiate swing trades. If you see a stock consistently below its declining 200 MA, you should not touch it until it goes back up the 200 MA. 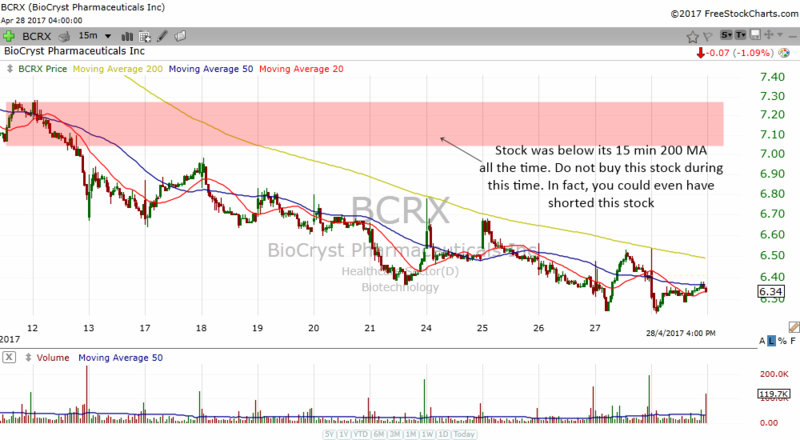 In the chart above, if you have touched BCRX while it was below the 200 MA, you would have suffered some terrible losses. The 200 MA was giving us a very clear warning not to touch this stock yet. A stock that has a bearish cross even in a bullish environment (above 200 MA) should also be taken very seriously. It tells us that the stock may not be very suitable at the moment for a swing trade. Look how the bearish cross gave traders an early warning of a trend change in BRX. The stock then dropped below its 200 MA and it was a clear warning to traders that this stock is not suitable for longs at the moment. 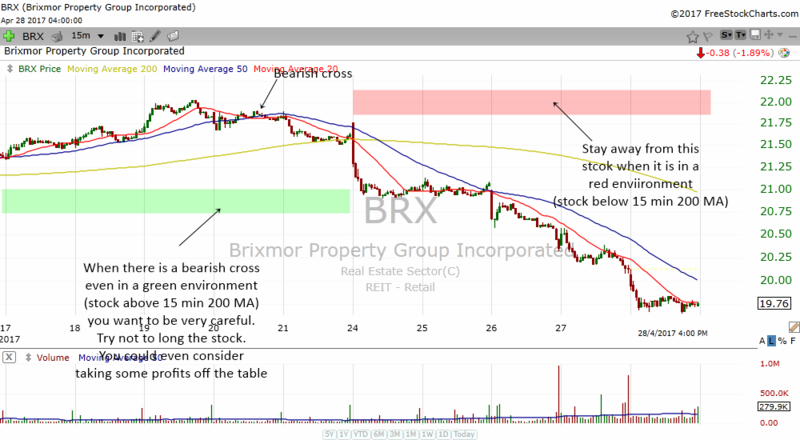 You now have a very useful and powerful tool to help you time your entry and exits in a stock. The smaller time frame allows you to zoom into a stock and see when is the most favorable time to buy or sell a stock. If you want to be more profitable and increase your win ratio, why not employ the 15 min charts now? You will be surprised by the results.